The seventh stage of the 2019 Dakar Rally gave competitors the first taste of a loop stage which started and ended at San Juan de Marcona. While the stage start was delayed due to extremely foggy conditions during wee hours of the morning, the weather provided no respite later as well since the conditions changed to windy and dusty. 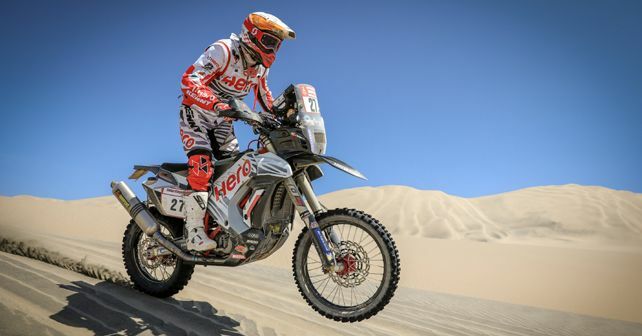 Continuing their cautious run, the stage did not cause any setbacks for Hero MotorSports as both Oriol Mena and Joaquim Rodrigues (JRod) were able to cross the finish line on an incident-free day for them. In fact, JRod became the fastest pilot for an Indian team for the day as he finished the stage in 11th. This is his best stage finish in the 2019 Dakar yet. JRod achieved this result despite making a stop near the end of the stage to help out Michael Metge of Sherco-TVS who had run out of fuel! Mena too soldiered on while recovering from an injured hand and knee from the previous stage. Mena finished the stage in 13th place. As per overall classifications, Mena leads out of the two at 13th while JRod is currently sitting at 24th. Metge brothers of team Sherco-TVS had a decent run. However, they were not able to improve upon their overnight positions much. Michael finished the stage in 15th while Adrien was a few positions behind at 27th. In the overall standings, Michael and Adrien are at 31st and 32nd, respectively. The lone Indian rider of the competition, Aravind KP, also salvaged a decent run. Despite facing issues with his navigation system on the previous day, he managed to end the stage in 46th, which meant an overall 47th place for him. Coming to the leaders, in the Moto class, 2017 Dakar winner Sam Sunderland (KTM) made a really good comeback by winning stage 7. In doing so, he recovered well from the troubles he faced in the previous stage where an issue with his rear brake left him 23 minutes behind the leader. Behind Sunderland, Honda riders Jose Florimo and Ricky Brabec filled in the remaining top three spots. While Florimo finished the stage just 1 minute and 51 seconds behind Sunderland, Ricky Brabec too wasn't far with a gap of 6 minutes and 30 seconds from the leader. In the overall standings, however, Sunderland remains in 4th place. Ricky Brabec currently leads the pack followed by Adrien Van Beveren (Yamaha) and Toby Price (KTM) in P2 and P3, respectively. In the Car category, victory went to Rally veteran Stephane Peterhansel (Mini). In fact, the day went well for the Mini contingent as they came home to a 1-2-3 finish, with Peterhansel followed by teammates Nani Roma (P2) and Carlos Sainz (P3). Those who did well in the previous stage were in for troublesome circumstances in Stage 7 as Nasser Al-Attiyah (Toyota) suffered a puncture and had to drive with a flat tyre for the final 10km of the stage. Meanwhile, Peugeot privateer Loeb was back into the title contention at the end of stage 6. However, disaster struck him as he lost nearly 30 minutes owing to an electrical fault. As a result, he ended the stage in 11th while Al-Attiyah was still able to salvage a 4th place finish. In the overall standings, Al-Attiyah still leads the pack but with the Mini duo of Peterhansel and Roma closing in on his lead. Peterhansel is still 29 minutes and 16 seconds behind Al-Attiyah. With just three stages left, the 2019 Dakar title is still anyone's for the taking as even a single stage is enough to turn the entire game upside-down.